After Breakfast, you will be picked up from your Hotel at 0700 hrs by your safari guide and depart by road to Lake Mburo National Park (the drive will take approximately 3-4 hours). You will have a stopover to look at the Royal Drum makers, stand at the Equator for a photographic opportunity and also listen to some few interesting facts. We will continue to Lake Mburo National Park, which is an extension of the Tanzanian plains with a variety of attractions; it is dominated by extensive wetlands, rolling grassy hills, seasonal and permanent swamps, wooden savannah, and forests, which harbors a variety of plants and animal species. 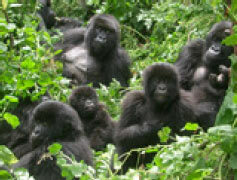 After early breakfast we shall drive to Bwindi Impenetrable National Park, home to the mountain gorillas! We shall arrive in Bwindi to have a late lunch. Day 3 Bwindi - Gorilla Tracking. Wake up early morning for breakfast to before the gorilla tracking at 8:00 am..
A reasonable degree of fitness is required as well as a sturdy pair of walking shoes, as this trek can take long hours of walking depending on their movement that day. Take with you lunch boxes and all the necessary gear to track the rare Mountain Gorilla, perhaps one of the most exciting wildlife experiences. It’s amazing to listen to them grumble to each other, and marvel at the sheer size of the dominant male; the silverback as well as watching them interact and play. After a morning breakfast, we will drive back to Kampala stopping en-route for lunch arriving in the evening. On arrival in Kampala, your safari guide will transfer you to your hotel.